Сарсембаев Марат Кабиевич (творческий псевдоним Марат Каби) писатель-фантаст, сценарист. Родился 26.12.1965 в городе Омск РФ. Женат, двое детей. С 2000-2015 год работал в системе МВД, МЮ на финансово-хозяйственных должностях. С 2010 начал свою литературную деятельность: пишет сценарии для фильмов, повести, сказки и рассказы в жанре фантастики. Является членом союза писателей «Союз писателей народов мира» Республика Казахстан. Был избран в совет по фантастике и приключениям писателей России. Является кандидатом союза “Интернациональный союз писателей” г.Москва. Marat Sarsembayev (pen name Marat Kabi) is a science fiction writer, screenwriter. He was born on December 26, 1965 in the city of Omsk, Russian Federation. He is married and has two children. From 2000-2015 he worked in the system of the Ministry of Internal Affairs, MJ on financial and economic posts. Since 2010 he began his literary career, writes screenplays for movies, novels, tales and stories in the genre of fiction. 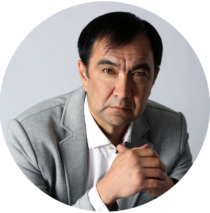 He is a member of the Union of Writers «Union of Writers of the World» Republic of Kazakhstan. He was elected to the council on science fiction and the adventures of the writers of Russia. He is a candidate of the Union «International Union of Writers», Moscow. Works: The novel «The Mask of the Cyborg». The story «I will become a free wind». The fairy tale «The Boy and the Crystal Ball». The fairy tale «Far countries».